Jon Buntrock is our bindery/warehouse person. 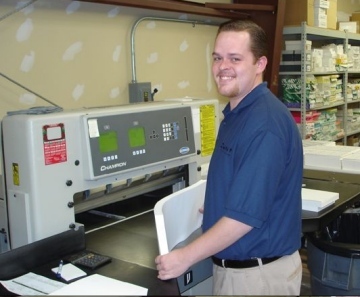 He is responsible for all shipping and receiving and finishing work on our in-house printed jobs. When not on the fork-lift he operates our paper cutter, folding machine, drill press, etc. Jon comes to us from Wisconsin. He has traded in his Cheese Head for Casinos. When not Casino hopping, you can find him gardening...we can't wait to get fresh vegetables!